Aaaah, those words were a part of my youth when sometimes my family would a eat home-topped Boboli instead of going out for pie. Yeah, man, those Bobos were good, but curiously, they were absent from my life for many years - gone from approximately 1987 to 2004. 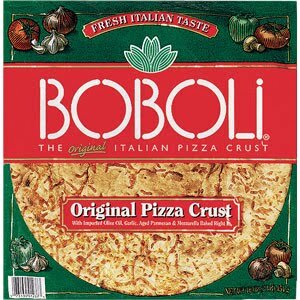 Eventually, Bobos again became part of my life when my brother and the World's Most Sophisticated Man visited me in California and we had an "Iron Chef: Boboli" competition. I made a Thai chicken Bobo, and Sophistication made a bbq chicken Bobo. My bro made a tomato-based Bobo and somehow won the competition. Bobolis are still in grocery stores, but they don't seem the same as back in the 1980s. The big corporation Grupo Bimbo owns the Bobos. But nowadays, Bobos often are sold with pizza sauce, and that seems confining and sacrilegious. Perhaps I'll make a Bobo soon for nostalgic reasons, but I don't know if I'll ever get back that Bobo glee I had in the '80s.